Bottled drinking water and local newspaper is provided daily. Our bathroom has hot and cold shower, and is complete with hygienic needs, towels and hair dryer. Our room also has an internet access, though the connection can get unstable for some time. The best part of our stay? Having this beautiful view from our balcony. Parking is along the streets, in front of the hotel, and the outdoor pool is free of use (though we weren't able to try it because it's too cold). Food delivery numbers were provided by the front desk during check-in. The choices were limited because of the distance of the area from the city center but good enough if you're too hungry. Only two restaurants (Cafe Voila and Coffee Bean) are located at the gate if you feel like driving a bit. 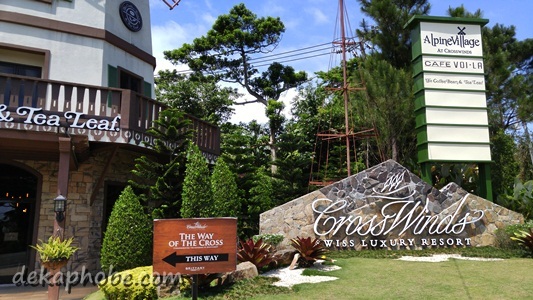 Overall, we had a wonderful stay at Crosswinds Tagaytay. We were highly impressed with the service: everyone was ready to help or assist us whenever needed, our room was always well maintained and our supplies were always restocked. I would love to stay here again when we return to Tagaytay.